Talking strategy at Brandworkers with a documentary film crew looking on. With largely stagnant wages and an almost surreal concentration of wealth at the top, working families find themselves deeply embattled trying to makes ends meet, particularly in communities of color and immigrant communities. Only a small portion of workers clocking in today will do so with meaningful voice or power on the job. The world is changing at a remarkable pace, yet disruptive innovation for the workers’ movement has remained elusive. The cause of workers’ rights needs many more attempts at dramatic invention and the time is ripe. The Worker Association Canvas aims to help working people and their organizations build this next generation of worker voice. The Canvas is a one-page tool to help you create a high-impact worker organization by identifying and getting right the most essential elements of your organizational model. The Worker Association Canvas is for rank and file workers, worker center leaders, union organizers, advocates, and technologists who seek to create or enhance organizations that will make big, dramatic change. It’s also for funders and advisers looking to support workers’ rights founders or improve their own resource allocation, learning, and impact measurement. The Canvas works as well for starting new initiatives as it does for understanding and deepening the impact of existing ones. It applies to worker associations broadly defined whether a worker center, a labor union, an organizing campaign, a digital platform with worker constituents, a mobile app, or some other novel form. The Canvas allows founders to document, test, and iterate the eleven most important building blocks of a worker association model. The primary concept behind the Worker Association Canvas is that it takes a complete organizational model to win. Even tremendous strength in some aspects of a model are not enough for a worker-based effort to endure, scale, and achieve justice. Not only do all the elements of your model have to work together, it’s highly unlikely that you’ve gotten all those pieces right at the outset. The Canvas allows you to rapidly validate the parts of your model that work and evolve the parts that don’t. Full business plans are very time consuming and contain a bunch of fantasies and fluff that can get in the way of finding a new model that works in the real world. Business plans are often written for external audiences and never get picked up again. To the contrary, the Canvas is just one page and allows your team to document and align on a model to test very quickly. The good news is that the essence of what makes an organization work or not can absolutely be distilled onto one page. Model innovation is powerful, so powerful that it’s changing whole industries again and again. Think of how rapidly iTunes took down the CD business, only now to be challenged mightily by the streaming and subscription model exemplified by Spotify. If we in the workers’ movement don’t embrace model innovation in our efforts, we can expect stagnation and a perennial game of catch up with the business world. The Worker Association Canvas is adapted from Alex Osterwalder’s landmark Business Model Canvas and Ash Maurya’s excellent version of it, Lean Canvas. If you’re interested in learning more, Dr. Osterwalder, who pioneered the model canvas concept, has developed helpful supporting tools and has done copious work documenting the importance of model innovation in general. Both the Business Model and Lean Canvases are outstanding frameworks that can be useful for worker groups. But understandably, as general business tools, neither fully get at what I’ve found are the most fundamental building blocks of a worker association. That’s why I developed a new one. The context for all three canvases is Eric Ries’s game-changing Lean Startup methodology and philosophy, which in turn was significantly influenced by steve blank’s Customer Development approach. 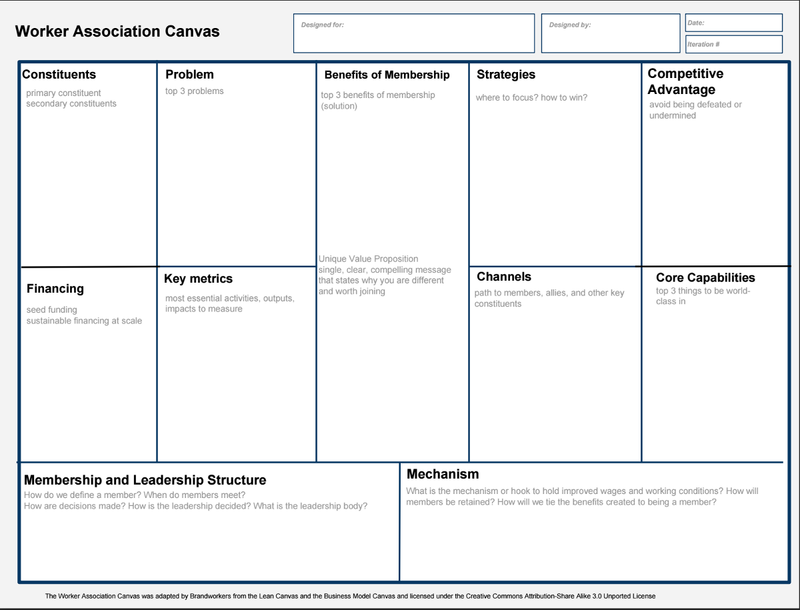 I developed the Worker Association Canvas to use with members at Brandworkers, where I serve as founding director. Brandworkers is a non-profit organization of food factory workers in the soaring local food sector that is evolving a new form of workplace association to achieve dignified jobs. The substantial benefit that we’ve seen from the Canvas and reports of its utility from some others who asked to use it led me to believe the time was right to release it to everyone. The workers movement is at a crossroads, showing impressive dynamism and making significant, but limited, progress in recent years. Workers centers, emerging and established, are blazing new trails in labor but are struggling to find scale, sustainability, and sufficiently dramatic job quality gains on the ground. Several labor unions have admirably increased their appetite for risk, lengthened investment horizons, adopted non-traditional strategies, and opened up to exciting new partnerships. But in the union space too, despite exciting momentum, the needle is yet to sufficiently move on the ground for workers. We need to empower frontline employees, unions, worker centers, and others with tools to launch many more transformational projects in order to achieve the scale and impact our times call for. Many initiatives will fail, surely; but some will succeed. 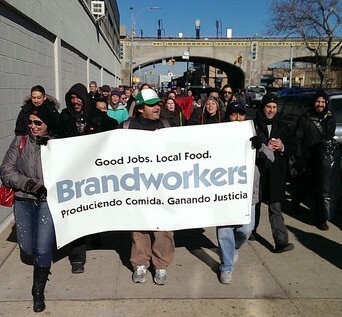 Factory workers in New York City’s local food industry on the march. I’m sharing the Canvas, and sharing it via Medium, with the hope of making a modest contribution to a more open ecosystem for workers’ rights innovation. Yes, the workers’ movement has conferences and trainings. Yes, we’re on Twitter and listservs. But the truth is that too much knowledge, especially from practitioners, is hard to access for many. There are valuable strands of startup culture that we can and should be embracing in the non-profit worker association space. The extraordinary amount of free and openly accessible methodologies, case studies, postmortems, and dialogues have no real analog in non-profit workers’ rights. We don’t have a culture of encouragement and permission to take on the big, crazy-sounding projects that have a high-risk of failure. These deficits are holding us back in a time of great change and uncertainty where learning and building new things are paramount. Hack the Union, Platform Coop, The Workers Lab, and the LIFT Fund are among the positive recent developments to celebrate and support. A growing number of emerging web applications from worker centers and others are creatively seeking to break through to the next level of impact. Thinkers at institutions like The Century Foundation have done superb work on labor organizing in the mobile Internet era. Still, we need many more networks, accelerators, funders, mentors, and practitioners committed to candor and peer learning for more worker-founders to succeed at innovation, at scale. I hope releasing a tool that has only been used internally thus far and sharing it as a work in progress to be built on in public will serve as one small step in the right direction towards a more open workers’ movement culture. Get the Worker Association Canvas now. You and your team start using the canvas by filling out its 11 boxes, each representing a fundamental building block of your organizational model. I’ve found that even at this early stage of documenting their model in a few minutes, worker-founders often find significant holes in their initial thinking. Those holes could have meant, without exaggeration, years of waste needlessly pursuing a flawed model. The next step is to review your canvas and identify the single riskiest assumption you’ve made. Is it whether workers even have the problem you’ve identified? Is it whether they will try out your solution? Is the big question whether you can attract seed funding? If your model includes a technical solution, can it be built? Or is your riskiest assumption that you can move a certain stakeholder that is essential to your model? This is not an exhaustive list but hopefully gives you a sense of some of the risks you might identify looking at your canvas. The final step is to validate or invalidate the assumptions you have made as quickly and cheaply as possible using creative experimentation out in the world. Start with the riskiest assumption and go from there. Every time you learn something, you’ll iterate the Canvas forward. If we’re honest, no one knows exactly what the next era of worker voice will look like. Strategies for big, worker-driven change almost never work as expected and need to be regularly refined or even taken in a dramatically new direction. By treating each building block of our model as hypotheses rather than truths to build a huge effort around, we can save an enormous amount of wasted time, money, and effort. Treating our beliefs as assumptions and subjecting them to rapid testing can be a tough discipline for those of us who grew up in the workers’ movement with fixed views on what good organizing was supposed to look like including heavy-weight plans and a long “underground” phase before launch. I highly recommend taking a look at Eric Ries’s Build-Measure-Learn feedback loop described in The Lean Startup for how to set up clever tests to get the validation you need on the building blocks of your model. It’s take a while to get used to. But the incredible simplicity and speed of a well-conceived lean experiment is an absolute game-changer for finding out what works by directly engaging the constituents that matter most to your model. The eleven blocks on the Canvas represent the most fundamental questions that a worker association must get right to deliver dramatic impact. If you get each block working, and most importantly, working together with the rest of the Canvas, you’ll significantly increase your chances of creating the large-scale change our movement and our world urgently needs. Let’s take a look now at how to fill out the Canvas with your founding fellow workers. (I’m including an example in each block to help explain the concept. Please note that the examples are just my interpretation of a group’s work, nothing more. I’ll link to each one in case you’re inspired to support any of them). List in this box all of the constituents or audience segments that you assume matter most to the success of your worker association model. Then, hypothesize which constituent is most important: the primary constituent. Successful worker associations pay attention to and invest sufficiently in all of their important constituents. But they have clarity on who the most important constituent is to their model, disproportionately invest in that primary constituent, and make tough choices in favor of that constituent. Some general categories of constituents you may want to think through are workers, staff, allies, voters, government officials, customers, community members, media, technologists, influencers, or opponents. You don’t want to document all of the constituents that conceivably matter to your model, just the most important ones for now. Finally, zoom in on your constituents and get as specific as possible in terms of industry, geography, demographics, interests, and any other relevant factors to get a precise handle on your audience. The more precisely you define your constituents, the better focused the rest of the canvas will be. Example of Constituents: Farm workers picking berries in the Skagit Valley of Washington for contractors of the Driscoll’s corporation. Majority are indigenous Mixtec and Triqui people from Oaxaca, Mexico. Approximate average age of 20 - 40 years old and majority are parents. List what you assume are the top 3 or fewer problems facing the worker and/or other constituents that matter to your model. The key here again is specificity. The better you come to understand the precise pain points facing your important constituents, the more likely it is you’ll build the right solution that members or users will give a chance to and stick with. What are your constituents looking to accomplish that they’re not able to? What are the existing alternatives out there that are failing to address the problem? a) List your top 3 or fewer benefits or solutions for members, users, or beneficiaries. What value are you offering to get the identified problems solved? Through which “product”? b) Create a Unique Value Proposition to test. Your Unique Value Proposition is a single, clear, and compelling message that states why your organization/campaign/app/website is different and worth joining. a) a non-profit worker association affiliated with a traditional labor union to bargain over key issues and pass legislation directed at on-demand transportation companies. Workers benefit from 1) a collective voice to remedy the problems they have at work, 2) information and support from a community of peers, and 3) the opportunity to help lead significant social change. b) Unique Value Proposition: Drivers Deserve a Voice. State your assumptions on two key questions: where will you focus your struggle and how will you win there? The playing field you focus on may be a certain group of workers, an industry, an occupation, an employer, a supply chain, a geographical area, an issue, a legislature or regulatory body, a channel, a tool, a platform and will typically be a combination of several elements. Determine how you will organize your activities to win in your chosen field of struggle. The bottom line in workers’ rights is you must be able to assert a substantial amount of power to win. You’re also likely to need an overall organizational strategy as well as supporting strategies. Example of Strategy: Focus on winning job quality gains and union membership for home health care workers in Connecticut, particularly providers paid by state funds. Develop political capital to seek an executive order creating an employing institution with which to bargain. Win by creating a partnership between home health care workers and the clients they serve around issues of broad public concern including workforce shortages and quality of care. How will you avoid being defeated by an opponent or undermined by a bad actor? Example of Competitive Advantage: Use proprietary research insights to drive strategic communications which increase the chance of petition success and reduce risk of employer retaliation. Achieve goodwill with target audience of rank & files workers and their advocates via a superior understanding of their needs and values, and validate that position by embracing a non-profit form. a) How will you obtain whatever seed funding you need to get to scale? b) At scale, how will you sustainably generate enough revenue to meet your expenses? b) membership dues + high-quality services at minimal cost with a strong, on-mission value proposition. For example, representation of drivers in ticket proceedings and providing mandatory licensing trainings. What key activities, outputs, or impacts that matter most to your model will you measure? Example of Key Metrics: 1) membership retention which has been a key problem in the national worker center community to achieve scale 2) leading indicators that predict retention including frequency and depth of engagement activities and of leadership activities 3) growth in value of job quality gains achieved. What is your path to reach workers, members, allies, and other important constituents? Example of Channels: Distribute product as a browser extension through the Firefox and Chrome extension download sites. Stimulate conversation on web forums and other online spaces where your target users congregate. Become indispensable to the successful work life of existing users to benefit from “word of mouth” referrals. Given the choices in your model, what three capabilities (or less) do you have to be world-class in for the model to work in the real world? How will you attain those capabilities? Will you attain them directly or through partners? Example of Core Capabilities: 1) Organizing and mobilizing ability for nationwide actions of largely unorganized workers. 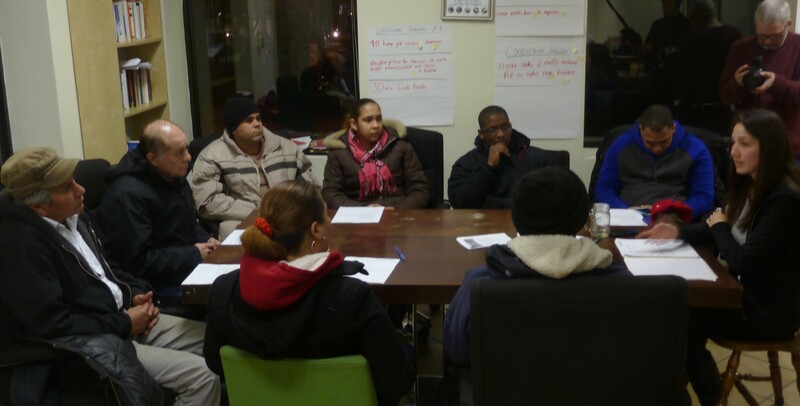 Accomplish through partnership between national union, union locals, and local community organizing groups. 2) Strategic communications capacity to help create a national conversation. Accomplish with communications partner. 3) Political capital and acumen to advance legislative, regulatory, and executive branch action in support of campaign objectives. How do you define a member or user? When do members or users meet? How are decisions made? How is the leadership decided? What is the leadership body? 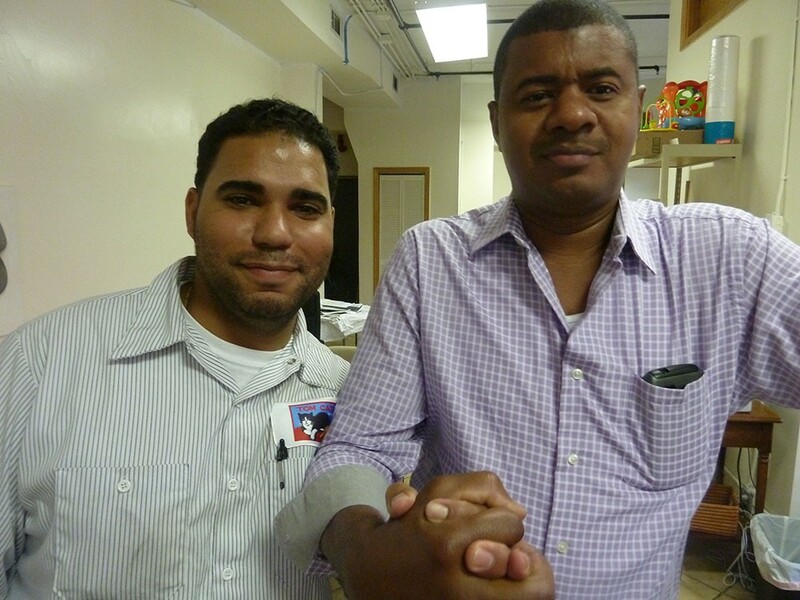 Example of Membership and Leadership Structure: Eligible potential members are New York City street vendors. Become members by paying dues. Decisions are made by majority vote in membership meetings. Leadership board is made up of street vendor members that are elected each year by the general membership. What is the mechanism or hook to hold gains in wages and working conditions? How will members or users be retained under that mechanism? How will you tie the benefits delivered to being a member or user? Some approaches to think through include a collective bargaining agreement, an employer code of conduct, a supply chain code of conduct, government regulation or legislation, a hiring hall, a traditional worker coop, a platform coop, a transparency vehicle, a certification system, a works council, or ongoing direct action. The most common mistake with mechanism is to conflate it with strategy. They are related, but very different. Strategy generates the power to achieve and sustain gains, while mechanism is the hook or container that holds those gains. Example of Mechanism: Hold standards through worker-driven social responsibility agreements that include a workers’ rights non-profit, farming companies, and the large retail chains that purchase from those companies. Give the Canvas a whirl. It only takes a few minutes to document the first iteration of your model. Any questions come up? I’m here to help and here to learn. Whether you’re thinking about founding or scaling the impact of a worker center or labor union, launching a campaign, or building an app or a platform, I believe you will find that the Worker Association Canvas dramatically increases your chances of finding the complete model that it takes to win. We know that basic economic security is out of reach for far too many working families, while the wealth they generate continues to concentrate at the top. It will take a fertile ecosystem of invention, risk-taking, and building to achieve collective worker power that wins in the 21st century. The stars are aligned for bold new models that offer up some much-needed disruption to exploitative employers and that meaningfully address the problem of staggering income inequality. Have an idea? Get started. Today. The workers’ movement needs you. Engage with me on Twitter around the Worker Association Canvas or workers’ rights innovation in general and let’s seize the immense opportunity for dramatic change in front of us. Daniel Gross is the founder and executive director of Brandworkers, the first and only non-profit organization dedicated to workers in the fast-growing local food production industry. He previously co-founded the IWW Starbucks Workers Union, the 21st century’s first fast food union, while working as a barista at the company. Daniel is a workers’ rights lawyer and co-author with Staughton Lynd of Labor Law for the Rank & Filer: Building Solidarity While Staying Clear of the Law. Founder/Executive Director @brandworkers. Interested in supporting collective worker change from the bottom-up. Organizing, law, food justice, technology.